An insider’s guide on the best way to get to and get around Cody, Wyoming. Cody, Wyoming is close to many major attractions and sights, situated in the northwestern part of the state and east of Yellowstone National Park. Cody itself is a great vacation destination, and shouldn’t be missed on your adventures. It’s easy to access Cody from any direction and simple to get around once you arrive. If you are flying into the area, the most used airport is the Yellowstone Regional Airport. Only 2 minutes from downtown Cody, it services this fabulous town as well as Yellowstone National Park and all northwest Wyoming visitors. Fly in year-round with no problems, connecting daily through Salt Lake City or Denver. All roads lead to Cody, so if you’re driving you can find it easily. If coming from the east or the west, you’ll find Highway 14/16/20 comes around into Sheridan Avenue. If coming from the north Highway 14A, you will also find Sheridan Avenue and go right into downtown Cody. Cody is only 52 miles east of the East Entrance to Yellowstone, and is an absolutely beautiful drive across the North Fork Scenic Byway. It will take you about an hour and is well worth the trip. U.S. 14 moves through the Shoshone National Forest and along the river, with fantastic scenery. You’ll catch some views of wildlife too. It’s almost guaranteed. Another option for driving into Yellowstone is to follow the scenic Chief Joseph Scenic Highway, Hwy 296, from Cody to Cooke City at the northeast corner of the park. This road is closed during the winter but is a spectacular drive during the summer. From Jackson, you take the Wyoming Centennial Scenic Byway or U.S. 26 and U.S. 14; all incredible drives. It is about 177 miles and will take you around three and half hours but as you drive through the diverse landscape you’ll be so glad you came. When visiting some of the Old West sights in Montana, you can drive from Bozeman to Cody, Wyoming. This is all part of the region that built our nation. Head east on I-90, and take Highway 212 south. With a couple jigs and jags, you will get to Wyoming Highway 120, which will take you to U.S. 14A and into Cody. The trip is 214 miles and takes about 3 ¼ hours. You take U.S. 14A out of Deadwood, South Dakota, then to U.S. 85. When you get to I-90 you head west for 168 miles to U.S. 16. All together it will be a 360-mile trip, but again worth every second. Cody is awaiting you at the end of your drive! 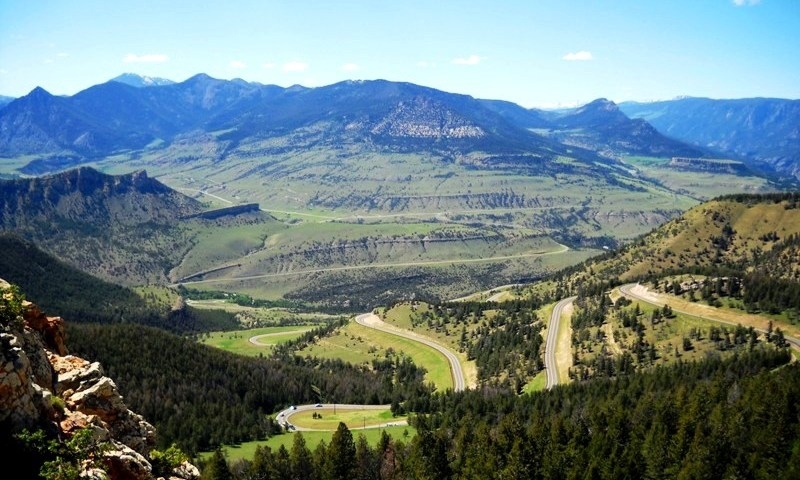 Driving across the Bighorn Range on the Big Horn Scenic Byway will give you spectacular views of the forests, rocky tundra and grasslands stretching into the distance. From Sheridan you take I-90 West to U.S. 14, which will take you right to Cody. It’s a marvelous drive of 148 miles. Many of the things around Cody that you will want to see are some miles outside of town. The best idea is to rent a car (which you can find at the airport). To reach those sights farther away, a car is imperative. Scenic routes around Cody make this even more desirable. In town, if attending the rodeo, you can catch a bus that shuttles folks between the Irma Hotel and events at the rodeo from June through September. Of course, you can call a taxi, but if you’re like me, you avoid these whenever possible. Public transportation exists that can get you from lodging to shops and restaurants and to the main close attractions. This runs from June 1st to September 12th. Some attractions you can get to on foot from the town’s main street, Sheridan Avenue. But with so many options available, you can avoid ruining your shoe leather and ride in comfort.